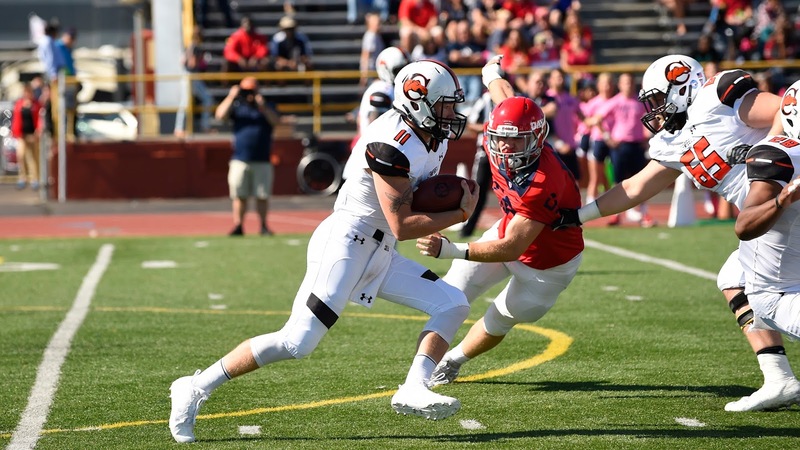 DAYTON, OHIO – Aaron Blockmon hauled in two touchdown passes and Campbell held Dayton to single digits in a 17-7 road win Saturday at Welcome Stadium, remaining unbeaten in Pioneer Football League play. 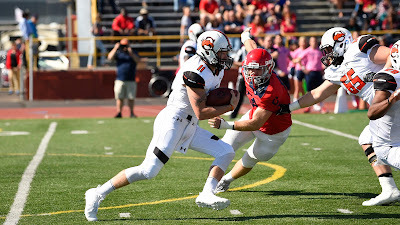 Campbell moves to 5-2 overall and 4-0 in PFL play, matching its best conference start in program history (2014). Dayton falls to 2-5 on the season and 1-3 in conference games. The win marked Campbell’s first against the Flyers, who held a 4-0 record over the Camels heading into Saturday. After a scoreless first half, Campbell took the second half kickoff and marched 83 yards on nine plays, capping the drive with a 20-yard Daniel Smith pass to former Southern Lee standout Aaron Blockmon for the game’s first points. It was the first time since 2012 (UVa.-Wise) that the Camels entered the halftime break in a 0-0 deadlock. The Flyers answered with their own scoring drive, going 71 yards in 6:09 on 14 plays, to tie it up at 7-all. Tucker Yinger’s 16-yard run set up a one-yard punch in from Alex Kenner. Campbell looked to regain the lead on its next possession, with Smith hitting Jaquan Brooks for a 31 and a 42-yard toss. The former South Point Red Raider broke for the end zone on the 42-yard pass, but Christian Searles knocked the ball out at the goal line and Dayton recovered for the touchback to keep the game tied. After Dayton’s drive stalled, Smith again took Campbell down the field, completing four straight passes, including a 38-yard strike to Blockmon for his second TD of the day. The grab put Campbell up 14-7 with 12:47 to go. With the Camels still up 14-7 with 4:04 remaining, former West Forsyth star Darion Slade picked off Dayton quarterback Alex Jeske in Flyer territory. Mitchell Brown’s 30-yard field goal made it 17-7 with 2:26 on the clock. The kick made the former Mount Airy Granite Bear Campbell’s all-time leading scorer, giving the senior 186 career points to pass Adam Willets. Former Hillside standout Gerald Wilkes’ interception, Campbell’s second of the quarter, with 52 seconds remaining sealed the win for the Camels. Blockmon caught four passes for 74 yards and two touchdowns, while Brooks notched a game-high 85 yards on four catches. Daniel Smith ran for 169 yards, completing 15-of-32 passes for 212 yards. Jeske paced Dayton with 228 yards passing on 27-of-48 tries, finding Ryan Skibinski six times for 47 yards. Yinger posted 113 yards rushing on 23 carries. Carlos Merritt topped the Campbell defense with 11 tackles, while Ray Miller made eight stops, including 3.0 tackles for loss. Former Olympic Trojan Emmanuel Olenga added a sack, bringing his season total to 7.5, tying the single-season school record. Searles forced two fumbles for Dayton, adding seven tackles and two pass breakups. Campbell travels to Butler on October 21 before returning to Buies Creek for its homecoming game against Jacksonville on October 28. Campbell Sports Information contributed to this story.